1-2 anglers is ideal; however I can take 3. If your group is larger I’ll be happy to recommend other guides. A full refund of the deposit will be issued if the trip is cancelled 30 days in advance. If the captain cancels for any reason, a full refund will be issued. Cancellation within 48 hours of the scheduled trip requires payment in full, unless I am able to rebook the trip. What dates would you like to book your charter? 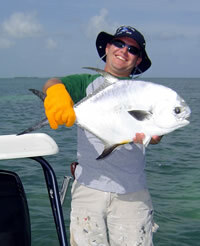 Do you have any fishing preferences - i.e. fly or spin?